The Academy of the Sacred Heart is selling $25 tickets for a chance to win $10,000! Please support the school by purchasing tickets. You can also help the Academy meet its total raffle goal of $50,000 by emailing and posting to social media in order to reach family, friends and business associates asking for their support. Money raised from this raffle will support the exceptional Catholic education of the Academy of the Sacred Heart, founded by our own St. Rose Philippine Duchesne in 1818. Buy 4 tickets and receive 1 ticket FREE. Ticket sales will close at 11:59 pm CDT on May 2, 2019. The winner will be drawn and announced during the Havana Nights Chemin de Fer Dinner Auction the evening of May 4. The winner does NOT need to be present to win. The Academy of the Sacred Heart will contact the winner within 15 days of the drawing. If you have questions you can click this link to view the contest Rules. 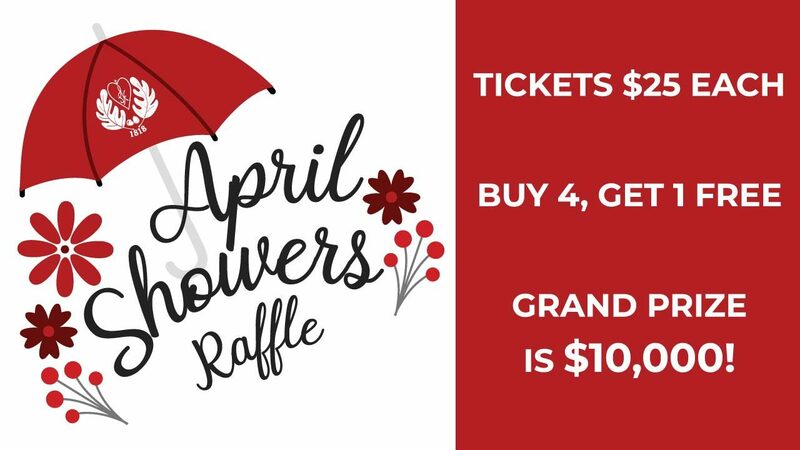 In the unlikely event this fundraiser does NOT sell 1,000 tickets, this raffle will automatically convert to “50/50, after expenses raffle” with the winner receiving their pro-rata share of the winnings. Thank you very much for supporting the Academy of the Sacred Heart. The school greatly appreciates your generosity!